Historically, there has been a lot of confusion surrounding the kit houses in Downers Grove. 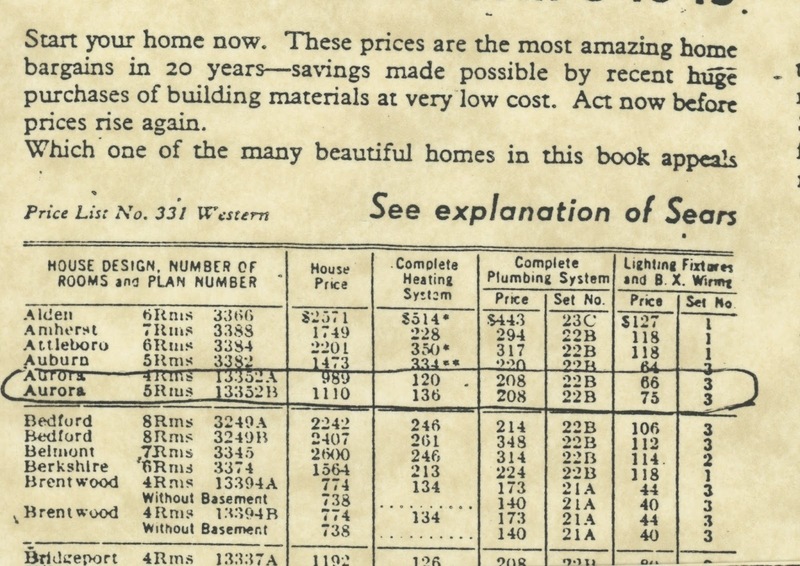 Houses were misidentified as kits, and some residents were informed that their houses were from Sears Roebuck or another mail-order company, when in actuality, they were not. The official count of kit houses varied wildly from year to year. One resident recently decided to start from scratch and generate a comprehensive, accurate list of kit homes in the community. 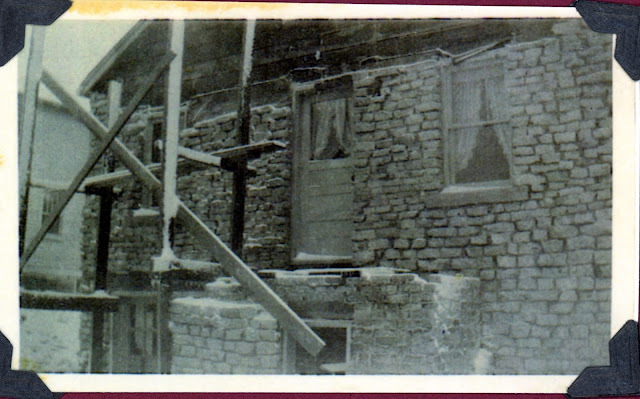 Chuck Holtzen revisited all the original information about the residences in town, which included historic photos. 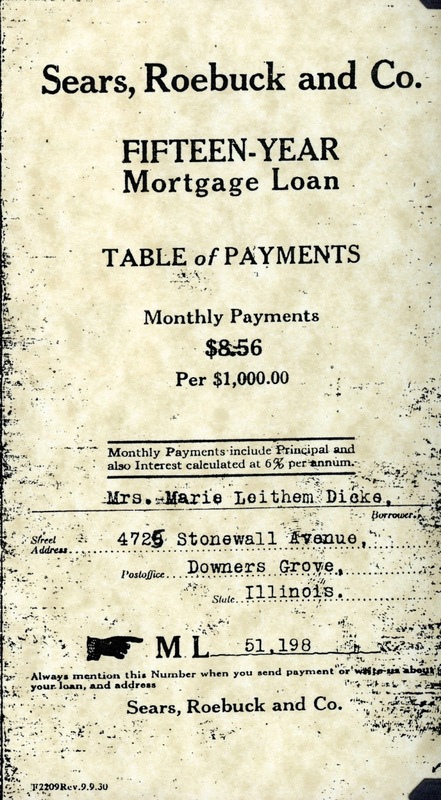 Additionally, Chuck took many trips to the county offices to gather old mortgage information that would show definitively whether a house was from Sears or Montgomery Ward or Harris Brothers. She spoke to homeowners, was invited inside houses, and obtained measurements that would prove that a particular house exactly matched a kit house model. This is how you get it done! The latest count of kit houses in Downers Grove is 87, with 67 being from Sears. And Chuck is starting a group called "Downers Grove Kit Home Owners", which will hold its first meeting in April. In honor of Chuck's efforts, today we'll feature one of the Sears houses in Downers Grove. The Sears Aurora was sold only in 1933. It was called the Hartford in the 1931 and 1932 Modern Homes catalogs. There have only been a handful discovered in the U.S., and Downers Grove has one of them (and it is proven to be from Sears!). 4725 Stonewall, Downers Grove. 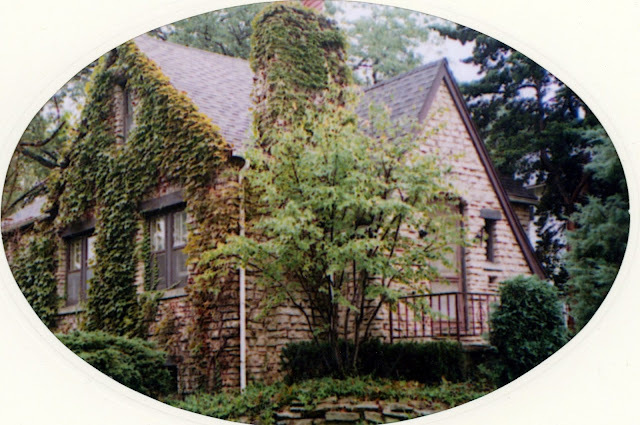 Photo from the Village of Downers Grove Architectural and Historical Survey. 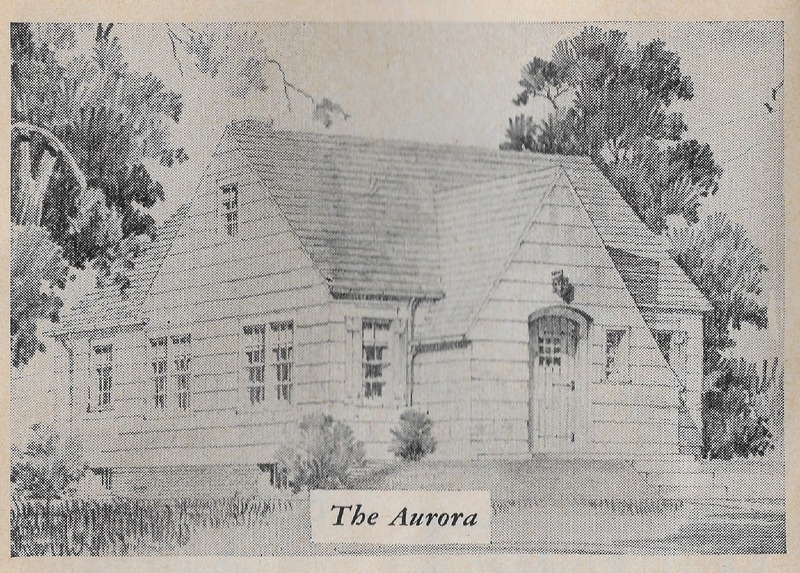 Sears Aurora, from the 1933 America's New Low Cost Homes catalog. An older photo that better matches the catalog illustration. Photo courtesy of Faith M. Dicke. 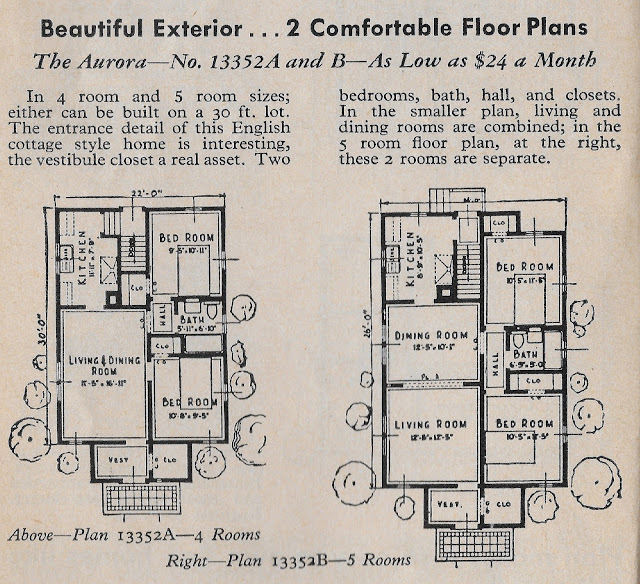 You'll notice one big difference between the house in Downers Grove and the Sears Aurora as illustrated in the catalog--the fireplace chimney in lieu of the front window. That fireplace is in the living room, and Sears would often allow customers to add (or eliminate) a fireplace. This is an authentic Sears Aurora. In 1933, Leonard and Marie Dicke took out a mortgage for $3900 from Sears. Leonard worked for the Dicke Tool Company, which was founded by his father. The Dicke family reports that Leonard and Marie had a flagstone veneer placed on top of the wood siding. This flagstone was brought by horse and carriage from a quarry in Lemont. The Aurora came in two floor plans. The Dickes opted for the larger one on the right. Leonard or Marie circled the Aurora in their copy of the America's New Low Cost Homes catalog. Photo courtesy of Faith M. Dicke. The Dickes took out a 15-year loan from Sears. Photo courtesy of Faith M. Dicke. 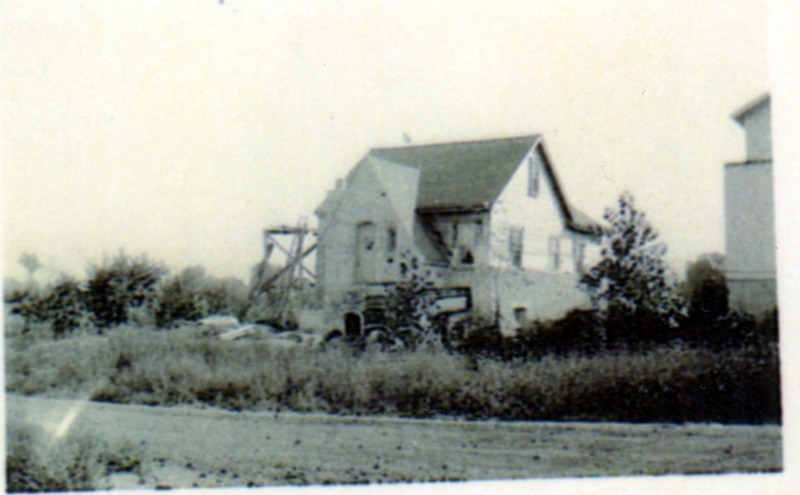 The house under construction. It was raised to accommodate a garage in the back of the house. Photo courtesy of Faith M. Dicke. The back of the house during construction. You can see the garage door in the lower left corner. At the top of the photo, you can see the original wood siding underneath the stone. 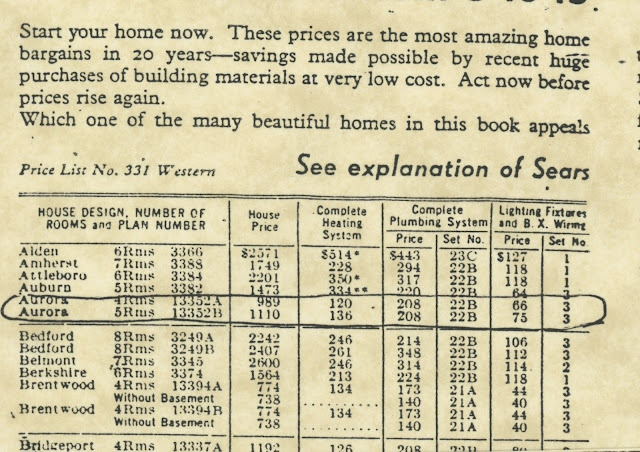 Sears houses were always built of wood framing, however the specifications were different if they knew the customer planned to put a brick or stone veneer on top. Photo courtesy of Faith M. Dicke. It's done! And someone is enjoying the snowy hill out front. That is an original door from Sears Roebuck. 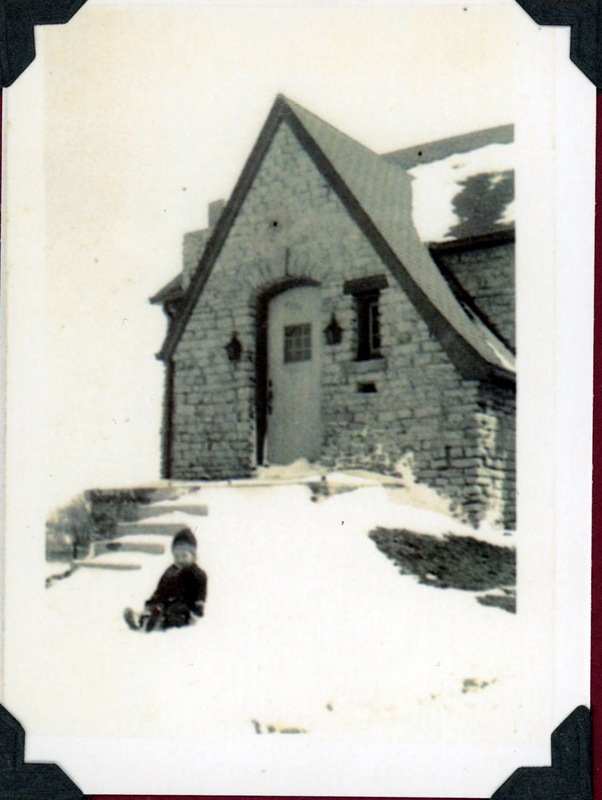 You can see the fireplace, but the chimney isn't as tall as it is today (chimney height codes have changed). Photo courtesy of Faith M. Dicke. The Dicke family still owns the house today.